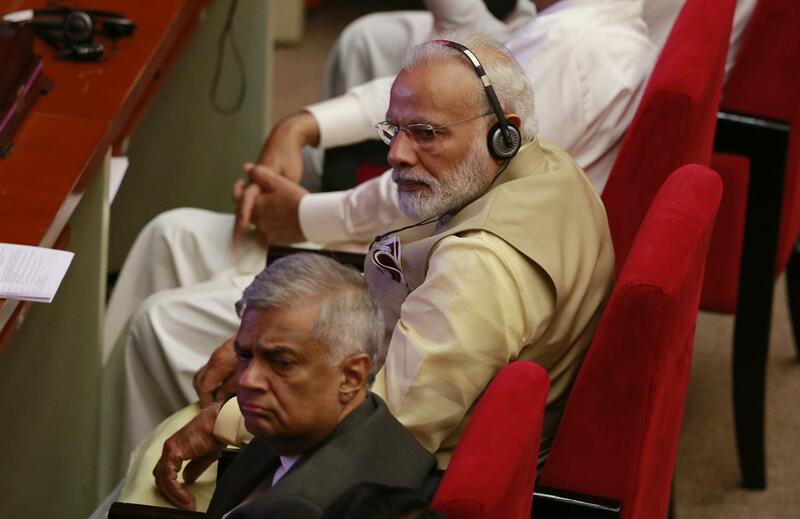 India’s prime minister emphasized common heritage with Sri Lanka on Friday as he tries to woo the island neighbor that’s become an important cog in China’s plans for control of the Indian Ocean. 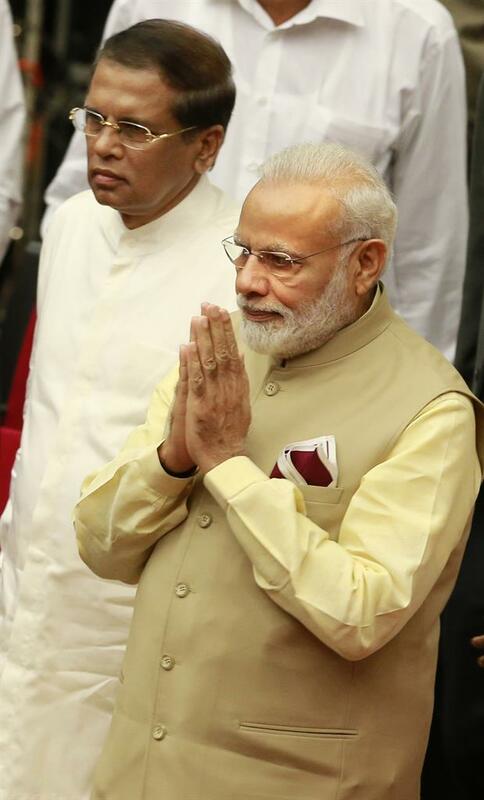 Prime Minister Narendra Modi made a speech in the Sri Lankan capital marking the International Day of Vesak, the remembrance of Buddha’s birth, enlightenment and death as part of his two-day visit to the country. He later went to meet tea-plantation workers with Indian ancestry. 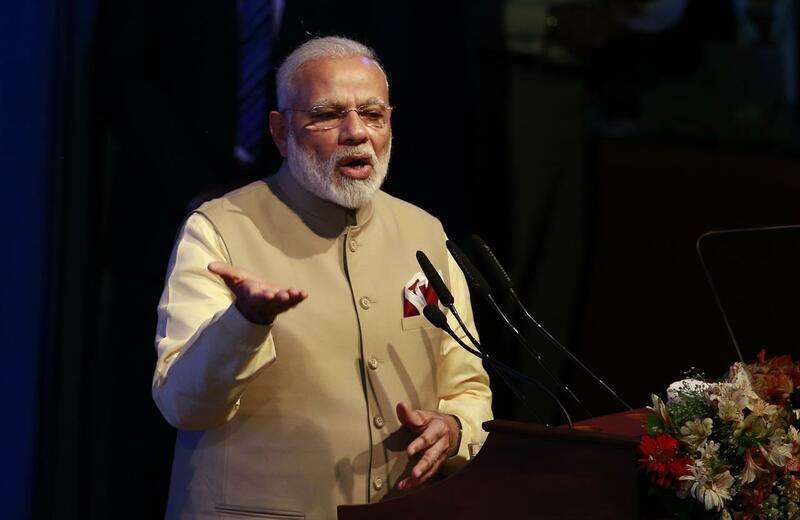 Modi said that the friendship between India and Sri Lanka was “etched in time by the ‘Great Master,’” a reference to the Buddha, whose religion spread from modern-day India to Sri Lanka and Southeast Asia. 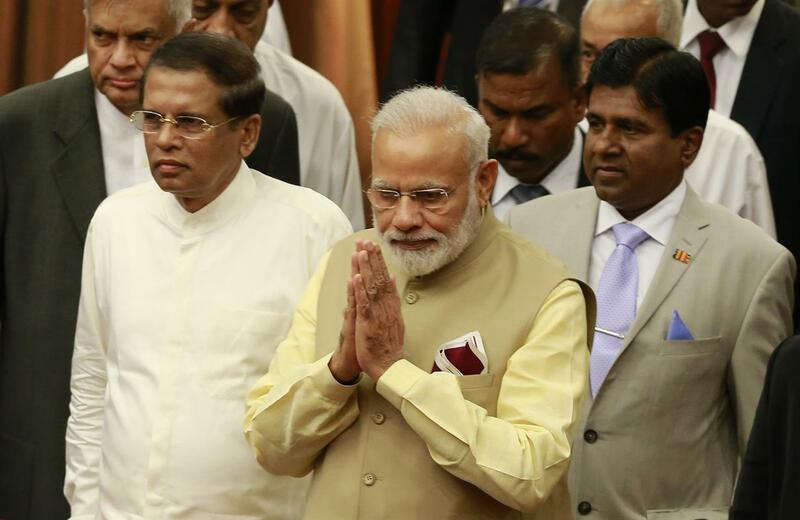 Modi’s emphasis on a common Buddhist heritage and shared history appears to be part of a new strategy of seeking untapped avenues to strengthen relations with Sri Lanka, which sits just 32 kilometers (20 miles) off India’s east coast. China has also been seeking to court Sri Lanka, using trade deals and infrastructure pacts to build influence. China unnerved India by building a sea port on Sri Lanka’s southern tip, a part of Beijing’s so called string-of-pearls plan for a line of ports stretching from its waters all the way to the Persian Gulf. Sri Lanka’s government has tried to balance both Asian giants since coming to power in 2015. It withdrew a previous agreement to give China part of an artificial island it is building for Sri Lanka. After Friday’s speech, Modi traveled to Dickoya town in central Sri Lanka, an area surrounded by lush tea plantations, to open an Indian-funded hospital. He then went for the first-ever meeting of an Indian leader with tea plantation workers of Sri Lanka whose ancestors arrived in the country from India nearly 200 years ago. Modi promised to build them 10,000 more homes in addition to the 4,000 houses already being constructed with Indian aid. 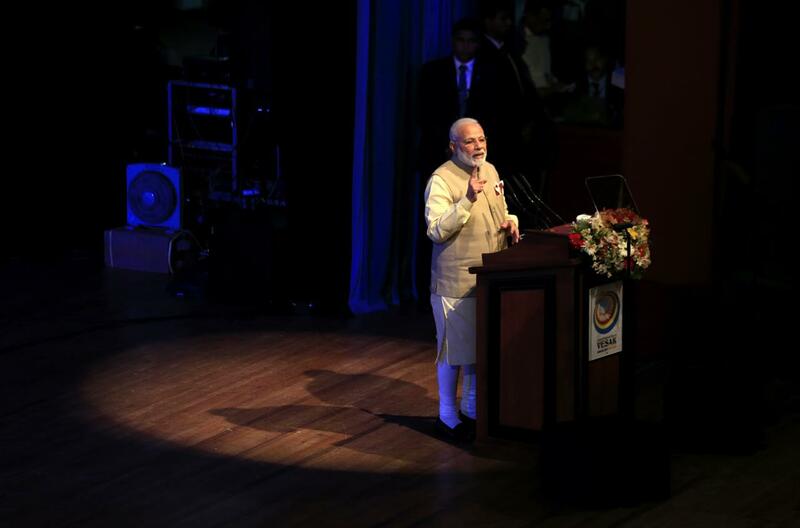 Modi was scheduled to return to India on Friday night. Meanwhile, Sri Lankan Prime Minister Ranil Wickremesinghe will travel to China on Saturday with a high level delegation to participate in the Belt and Road Forum on China’s envisaged plan for a wider global trade network. 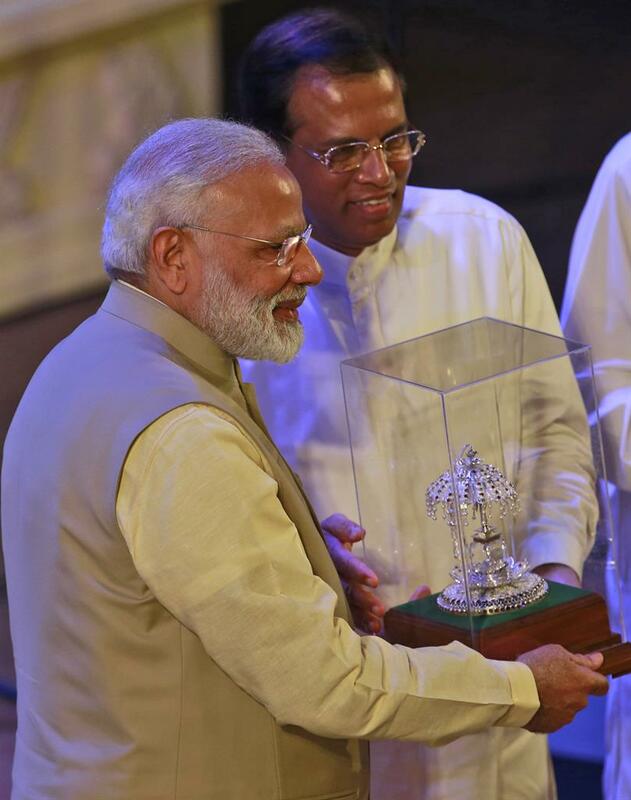 Sri Lankan President Maithripala Sirisena, right, hands over a mometo to Indian Prime Minister Narendra Modi during the UN celebration of Vesak ceremony in Colombo, Sri Lanka, Friday, May 12, 2017. During his two-day visit Modi participated in the United Nations celebration of Vesak or the day of birth, enlightenment and death of the Buddha. He also inaugurated a modern hospital for the benefit of tea plantation workers , ancestors of Indian laborers brought by the British from the 18th century. 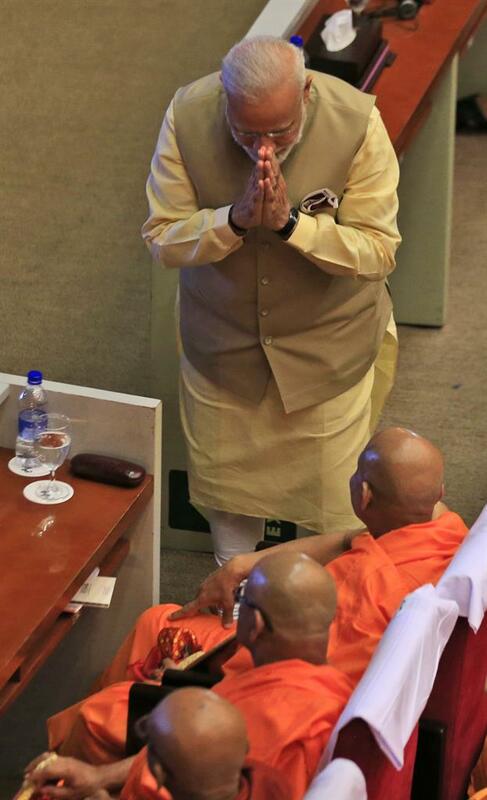 Indian Prime Minister Narendra Modi greets Sri Lankan Buddhist monks during the UN celebration of Vesak ceremony in Colombo, Sri Lanka, Friday, May 12, 2017. During his two-day visit Modi participated in the United Nations celebration of Vesak or the day of birth, enlightenment and death of the Buddha. He also inaugurated a modern hospital for the benefit of tea plantation workers , ancestors of Indian laborers brought by the British from the 18th century. Indian Prime Minister Narendra Modi greets the delegates as he arrives at UN celebration ceremony of Vesak or Buddha Purnima with Sri Lankan President Maithripala Sirisena in Colombo, Sri Lanka, Friday, May 12, 2017. During his two-day visit Modi participated in the United Nations celebration of Vesak or the day of birth, enlightenment and death of the Buddha. He also inaugurated a modern hospital for the benefit of tea plantation workers , ancestors of Indian laborers brought by the British from the 18th century. Indian Prime Minister Narendra Modi addresses the gathering at the UN celebration of Vesak ceremony or Buddha Purnima in Colombo, Sri Lanka, Friday, May 12, 2017. During his two-day visit Modi participated in the United Nations celebration of Vesak or the day of birth, enlightenment and death of the Buddha. He also inaugurated a modern hospital for the benefit of tea plantation workers , ancestors of Indian laborers brought by the British from the 18th century. 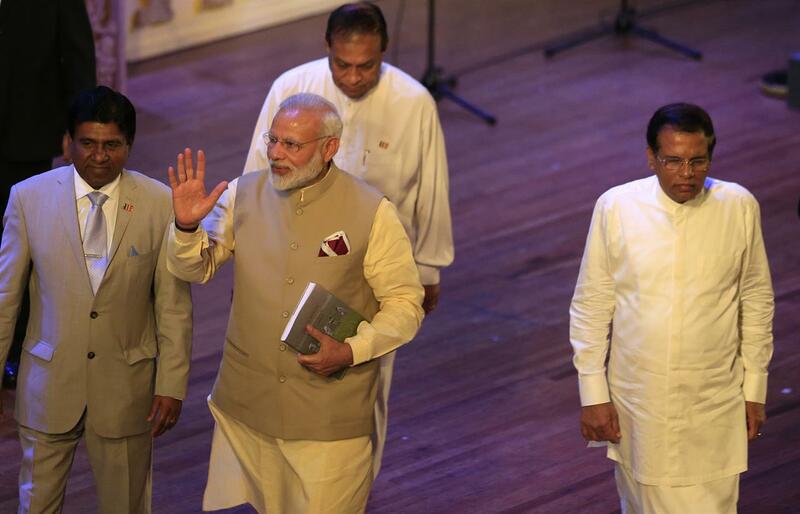 Indian Prime Minister Narendra Modi, center, greets the delegates as he arrives at UN celebration ceremony of Vesak or Buddha Purnima with Sri Lankan President Maithripala Sirisena, second left, and Sri Lankan Prime Minister Ranil Wickremesinghe, left, in Colombo, Sri Lanka, Friday, May 12, 2017. During his two-day visit Modi participated in the United Nations celebration of Vesak or the day of birth, enlightenment and death of the Buddha. He also inaugurated a modern hospital for the benefit of tea plantation workers , ancestors of Indian laborers brought by the British from the 18th century. Indian Prime Minister Narendra Modi, center, waves as he leaves after the UN celebration ceremony of Vesak with Sri Lankan President Maithripala Sirisena, right, in Colombo, Sri Lanka, Friday, May 12, 2017. 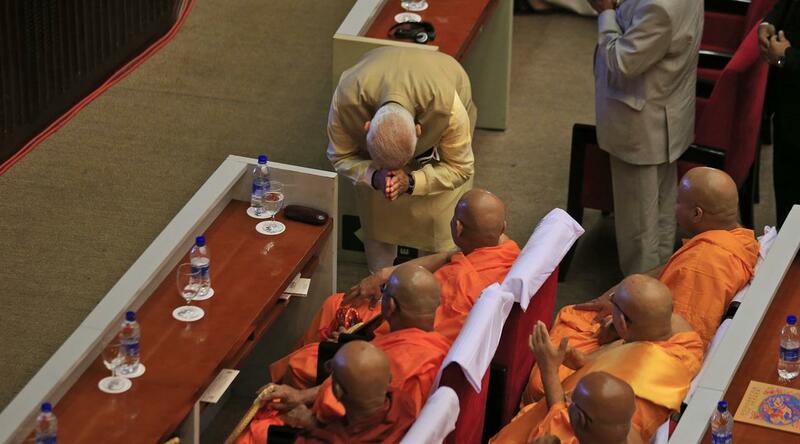 During his two-day visit Modi participated in the United Nations celebration of Vesak or the day of birth, enlightenment and death of the Buddha. He also inaugurated a modern hospital for the benefit of tea plantation workers , ancestors of Indian laborers brought by the British from the 18th century. 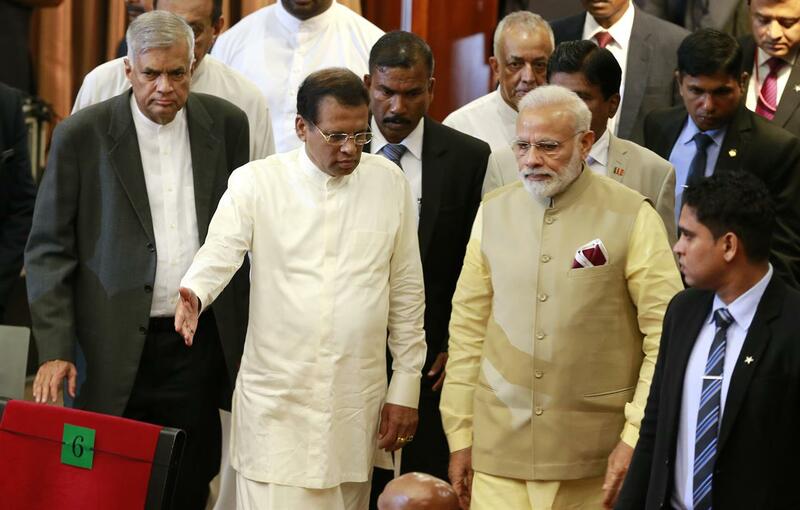 Indian Prime Minister Narendra Modi, second right, arrives at UN celebration ceremony of Vesak or Buddha Purnima with Sri Lankan President Maithripala Sirisena, second left, and Sri Lankan Prime Minister Ranil Wickremesinghe, left, in Colombo, Sri Lanka, Friday, May 12, 2017.